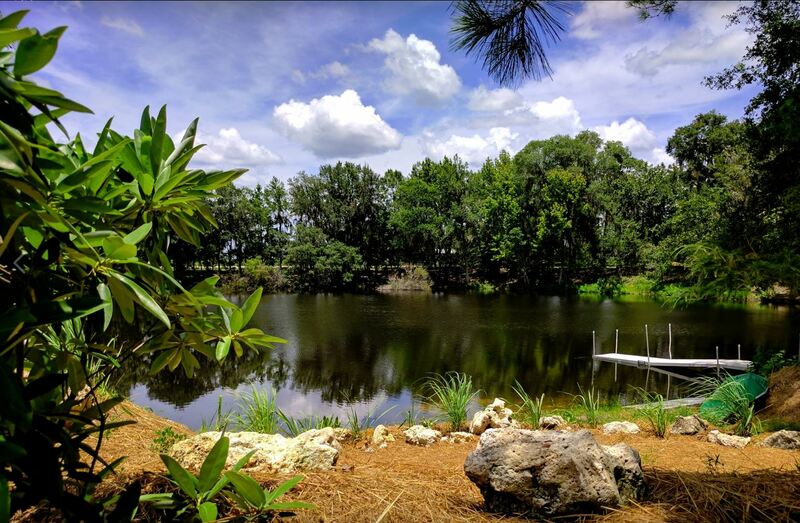 Retreat to Alachua Florida’s Deep Spring Farm for Ecology | Edibles | Events. Customize your experience within 22 acres of organic farm gardens, springfed ponds, meadows, woodlands, and essential facilities for people. Catch up with farm owners/operators Michael and Leela Robinson for a tour of organic farming projects and processes. Help with the harvest of U pick organic blueberries in June/July, pick your own organic cut flowers, purchase seasonal fruits and vegetables year round. Enjoy freshwater recreation in Deep Spring and Sunrise Ponds and nature trail biodiversity at your leisure. Bring your own pack in/pack out picnic plus refreshing beverages to enjoy on the waterfront shaded by sprawling live oak trees. Host weddings and celebratory gatherings, workshops and benefits that practice ecotourism principles of zero waste and leave no trace. Yoga instruction, yoga swing instruction, massage therapy services available onsite. Guest camping/glamping coming soon. Organic farming is a community effort and your participation makes a big difference, especially in the challenging, hurdle filled early years of massive investment and limited income. We have given our all to reclaim and preserve this bit of Old Florida for current and future generations. Your patronage enables the farm to prosper: to grow the best food, save our springs, and host one of a kind events in North Florida’s springs heartland. Your ongoing support makes organic farming and environmental conservation sustainable: partner, sponsor, volunteer, donate. Join the email list to be the first to know newsworthy updates: https://www.deepspringfarm.com/subscribe/. Email / text ahead to come see what is growing on. Let’s leave a community legacy of sustainability.